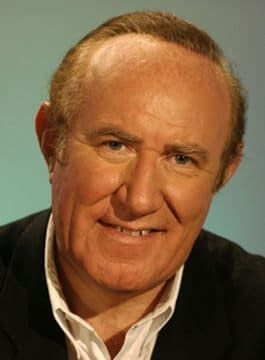 Andrew Neil is an editor, writer, broadcaster and business consultant on media matters, working out of London, Edinburgh, New York and France. Andrew presents The Daily Politics Show, This Week and Sunday Politics all for the BBC. A prolific trailblazer in the word of publishing and media, he has been the UK Editor of The Economist, Editor of The Sunday Times, Executive Chairman of Sky TV and Executive Editor of Fox TV News USA. Andrew Neil is the Chairman of Press Holdings (owners of The Spectator, Spectator Health, Life, Money & Australia; and Apollo). After graduating in 1971 with an MA (Hons) in Political Economy and Political Science, Andrew worked as political adviser to the Secretary of State for the Environment in Edward Heath’s Conservative Government. In 1973, he became a correspondent for The Economist and began appearing regularly on British television and radio. He became the American correspondent for The Economist in 1979. Whilst in the USA, he made several network documentaries and appeared regularly as a political and business commentator on U.S and U.K radio and television. Neil returned to London in 1982 to become the UK Editor of The Economist – the official history of The Economist states that under Neil’s leadership the magazine enjoyed more scoops than the rest of Fleet Street put together. In 1983 he became editor of The Sunday Times where he remained for 11 successful years, and at the same time presided over the launch of Sky Television. In 1991, he launched his own Sunday morning talk radio show for London Broadcasting and this became the highest rated show on LBC. In the summer of 1994 he was seconded to New York to become executive editor of Fox TV’s first steps into network news. In late 1994, Andrew decided to resign from both The Sunday Times and Fox Television to begin a new career as an independent broadcaster. Neil now presents This Week with former conservative MP Michael Portillo, and Labour MP for Hackney Diane Abbott. He also presents the Daily Politics Show on BBC Two and Sunday Politics on BBC One. Andrew Neil is an acknowledged expert on British, European and American politics and business. Andrew is available for keynote speeches, after-dinner speeches and conference facilitating.